Tim's Chips Kettle Style range sat neatly alongside their regular Chips, but as the company has now been absorbed by Pinnacle Foods, Hawaiian appears to be moving into a standalone brand position. The bag designs cram as much 'Hawaii' onto them as they can, but it works. You do tend to need to ram home a point if you want customers to pick them off the shelf on a cold and dark winter's night in a supermarket far far away from Hawaii. 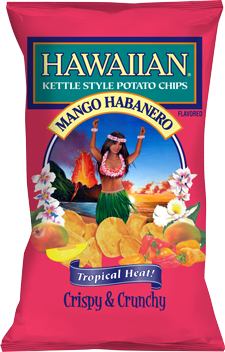 The 'Hawaiian' logo and flavor are given prominent positioning and the bags are all flavor color coded. The central image is also different with each flavor. If the bag says they are 'Crispy and Crunchy' they must be. Well this is usually our cynical approach, but hey, they were exactly what they claimed. The superior crunch of a Kettle Cooked Chip was matched and surpassed by these, brittle yet firm, crisp yet rigid, Chips. More thin than Tim's Cascade Chips, but just as thick as anyone else's Kettle Chips. These Chips seemed to lack the oil bubbled profile and texture of many Chips of this type. The oil stained consistency remained true to the Chip, and there was a little browning. Some random seasoning was visible. Now this is what you call an exciting flavor. Regular readers of Chips & Crisps reviews will know that we are not the biggest fans of 'Original' or potato flavored Chips. So when we saw this weird combo we just had to get stuck in. The bag's salt content info raised our interest further - most Chips of this type are packed full of salt. The Habanero in these Chips did not however need any help showing itself. Sure a sweet flavoring (possibly Mango), pushed the Habanero out the door, but once it was outside it ran down the street screaming. Yep, job done.